For day four of my summer wrap up week, I am bringing home the post I wrote for Shaffer Sisters’ Make for Mom series they ran earlier this summer. I love those Shaffer ladies. They have a great dynamic and I really enjoy their variety of posts. They also have been doing a link up party every Tuesday this summer so you should check out the inspiration over there. When I was thinking of what I would “Make for Mom” I decided to go through my closet and find something I don’t wear anymore and make it wearable. Lets be honest, now that I am a mom there are a few items in there that my child-bearing hips are not meant to wear, hehe. One of which is this old polo shirt dress. 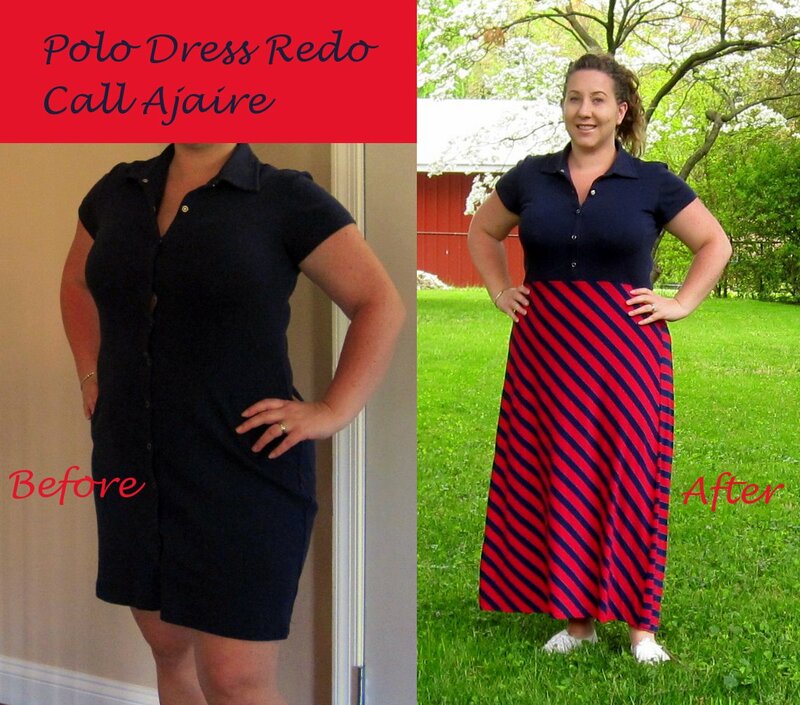 I’m still happy with the look of a polo shirt on my body shape, but the bottom half of the dress is rife with issue. The length is too short, there is pulling in between the snaps from the bust down, and the shape is completely unflattering. This was a perfect candidate for a remake. I started out by deciding how high up I wanted to cut the bodice. Then I just drew a chalk line and used my rotary cutter to cut between the snaps. To fix the gapping between the snaps I decided which was the last snap down that I would use and sewed the sides shut below that point following the pink lines on the cut bodice in the above picture. 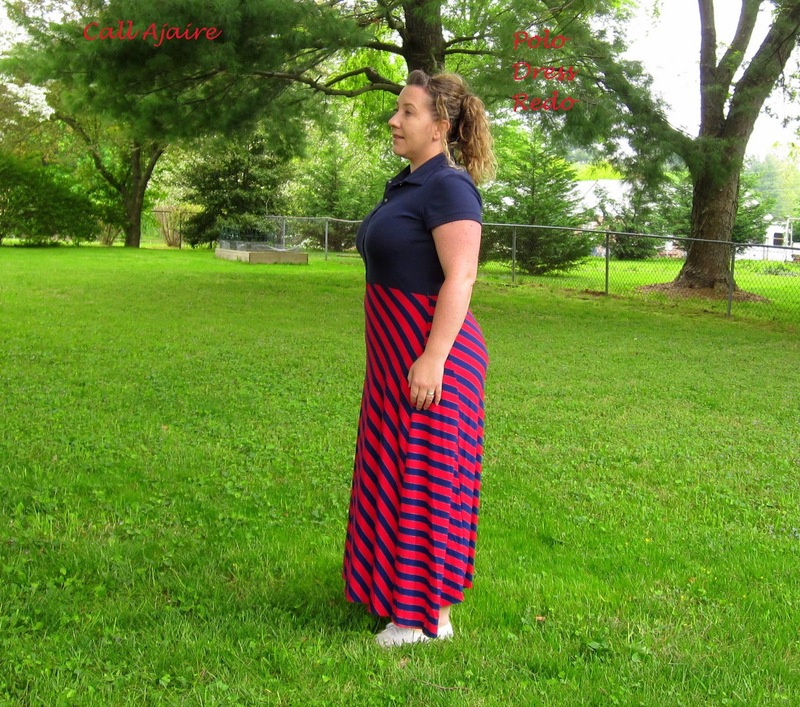 Since I wanted a more flowy skirt I went for this poly blend I found at JoAnn Fabrics. There is a tiny strip of silver metallic thread in between the stripes, so in person it is a lot less “Ernie” from Sesame Street, hehe. 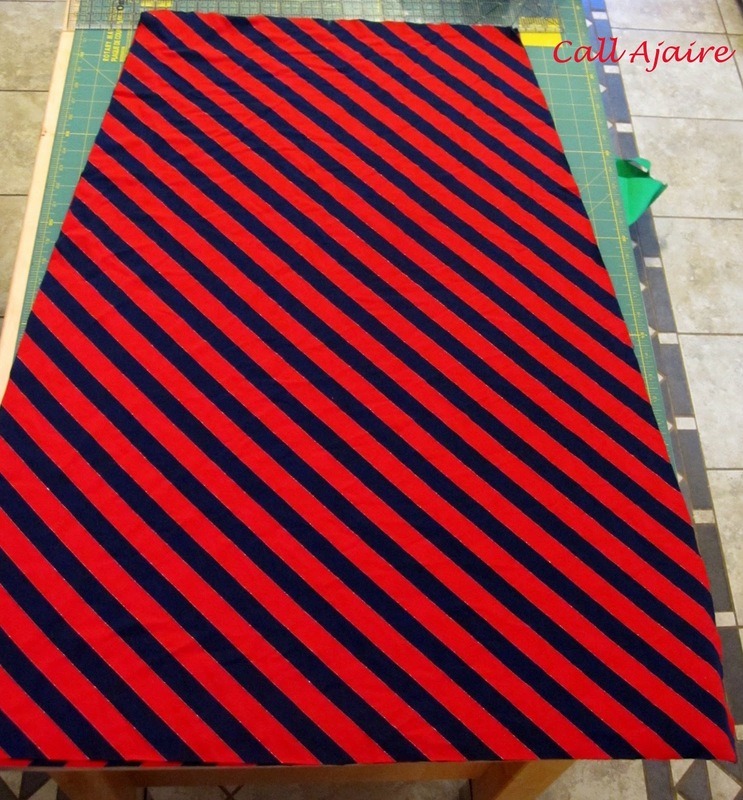 I turned the fabric to the bias (diagonal stripes in this case) so the drape would be better for my shape. 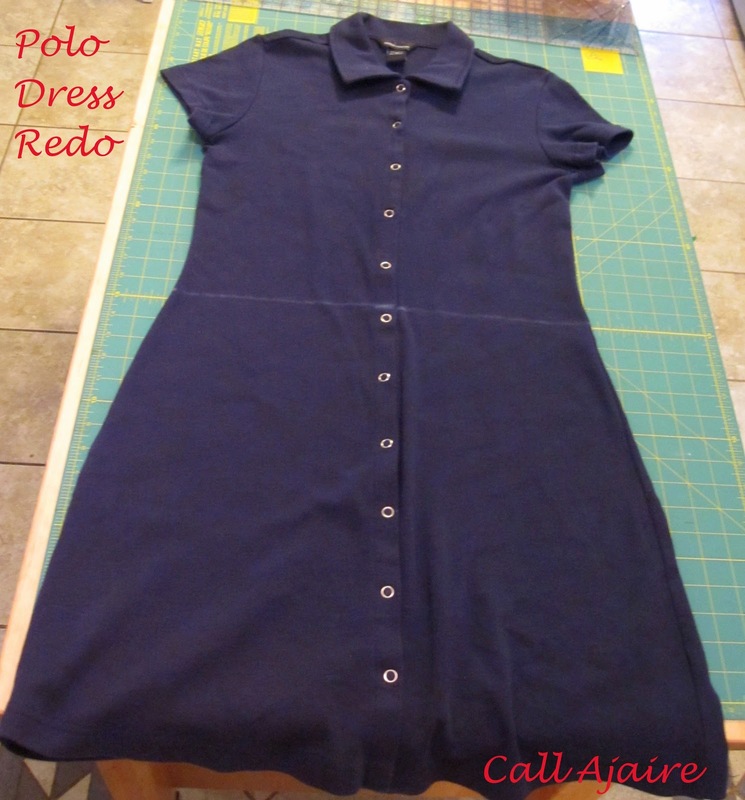 In order to decide how wide to cut the skirt waist, I measured on either side of the width of the polo bodice (in the picture above, you can see that I hadn’t cut the skirt off the polo yet) and added a bit for seam allowance. This was all sort of on the fly, so I don’t have exact measurements. The good thing about this type of fabric however, is that it is so forgiving once it’s sewn together with the way it drapes that I’ve found being exact isn’t so necessary. I simply cut a sort of wide A-Line shape from the top of the waist down to a maxi length on one side. 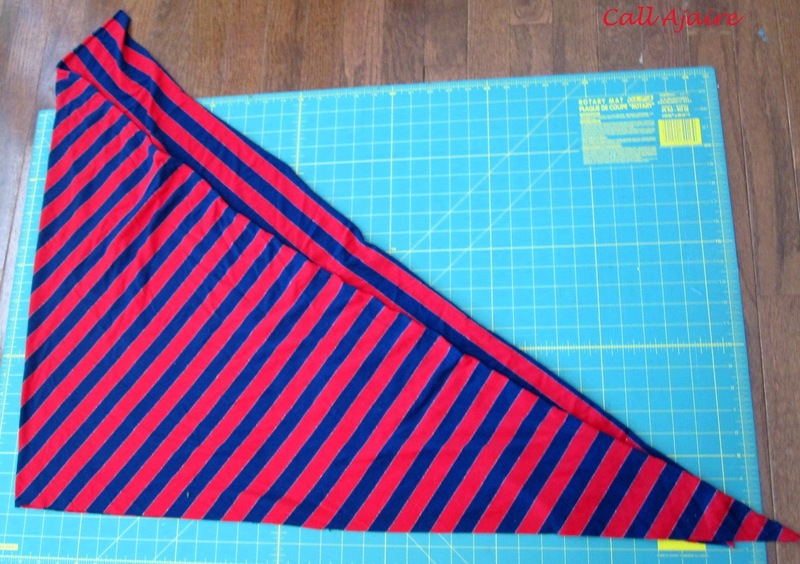 I don’t have a picture of the next step, but I just folded over the cut side at the center point of the waist measurement, and used that shape to cut the same angle on the other side. In order to get the shape I was looking for, I thought adding a gore at each side seam would do the trick. So I simply cut two long triangles from the leftover bias fabric. The only thing I thought about was that the length should be roughly the length of the skirt panels I’d already cut AND that the top of the triangle should come to a narrow point (the bottom right hand corner in the above picture) since I didn’t want to add any width at the waist which is where I would insert the gore. 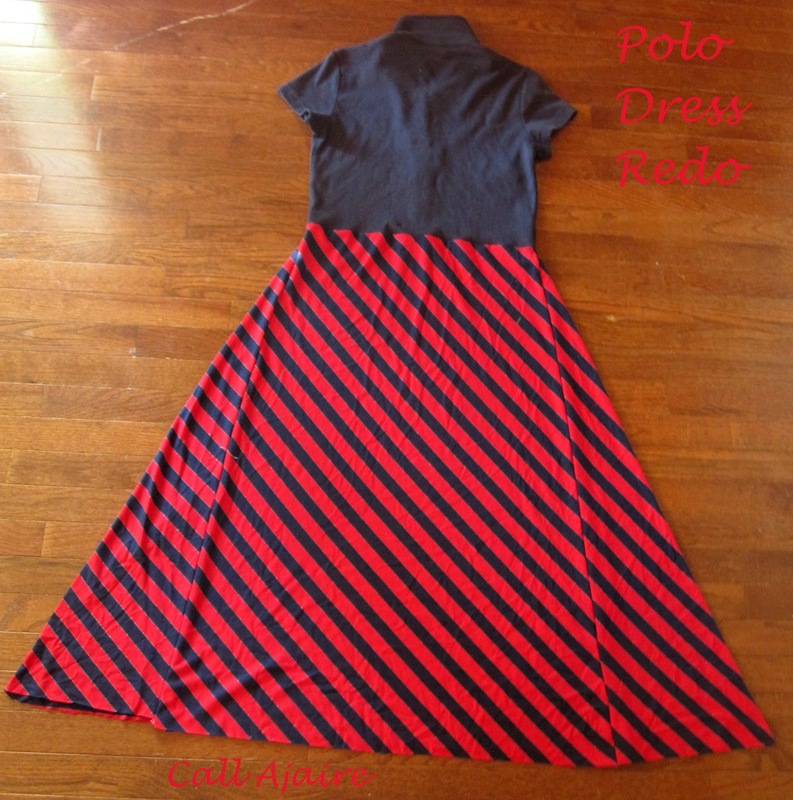 Again, I didn’t use a lot of precision since I wanted this dress to be casual and I knew this fabric is forgiving. I don’t have any pictures of the next few steps since I was trying to get it sewn quickly while my daughter was napping, but here’s a quick rundown. 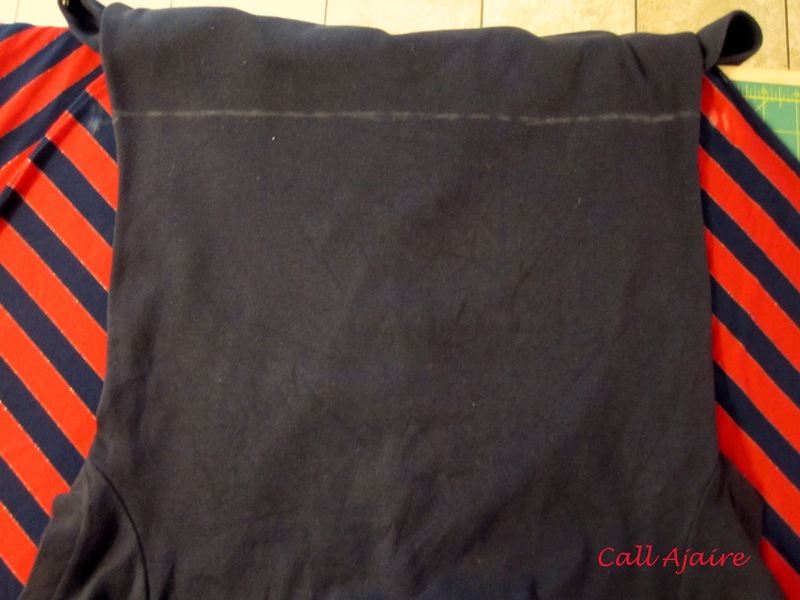 I used my serger for all the seams, but you could use a stretch stitch on your regular machine. 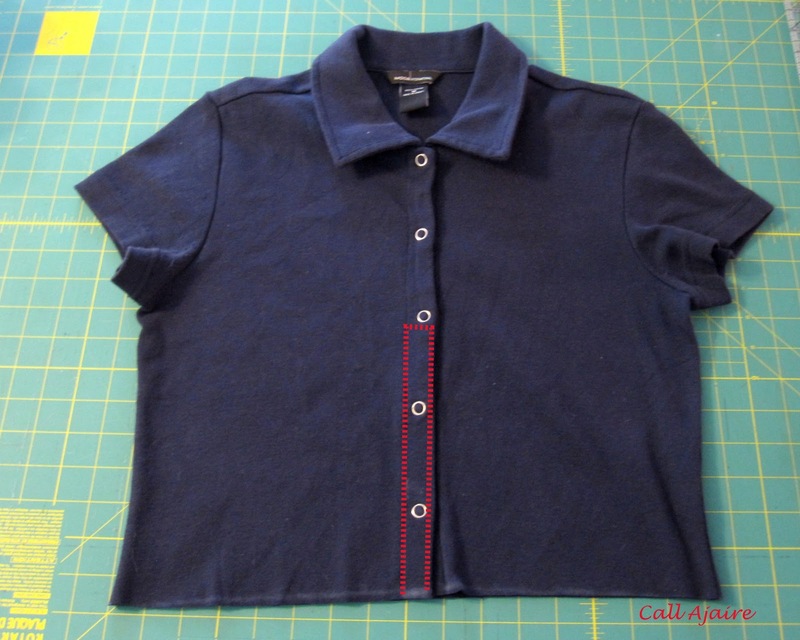 I unpicked the seam on both sides of the polo bodice about two inches from the bottom so that I could attach the skirt. Then sewed the back bodice to the back skirt panel with right sides facing. Then did the same for the front bodice and skirt panel. At this point I tried it on to make sure the fit would be correct with the length of the bodice and to be sure I wanted to include the gores. The side seams weren’t sewn yet, but I could still approximate the fit. Then I sewed one gore to each side of the front skirt panel, starting with the tip at the new seam where the bodice and skirt meet. Then I matched the other side of each gore up with the corresponding back skirt panel and pinned. Starting at the point on the bodice where I had pulled the stitching I sewed the final seams, closing the bodice seam opening as well. This is the back of the final dress. You can see that I haven’t finished the hem yet. Since it’s a knit, it won’t fray so I could leave it as is, but I’ll probably do a simple roll over hem or something like that. I’m having trouble deciding so I’ll leave it as is for now. And here is the front. 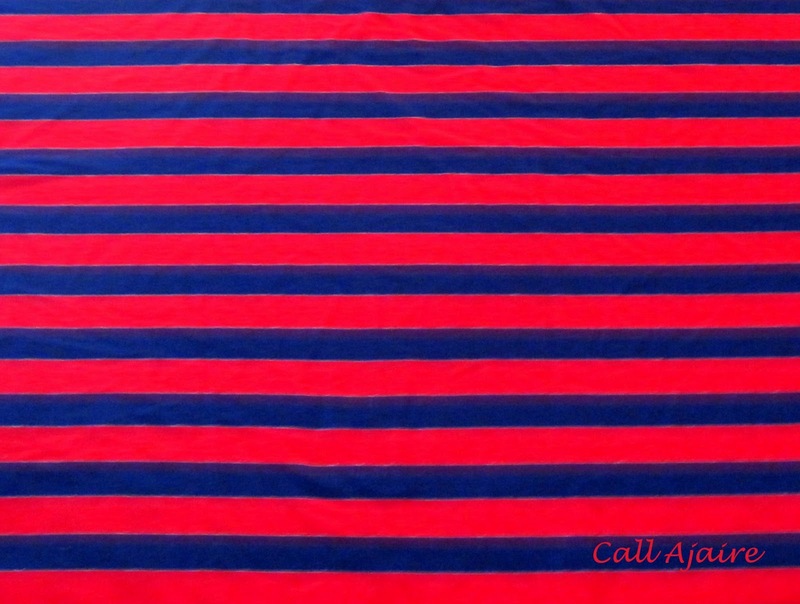 If I had taken more care, I could have made the gores have a different stripey shape, but you’ll see that once it’s on my body and the skirt is draped that it doesn’t really make a difference. It’s hard to show in a picture just how flowy the skirt is with the help of those gores. The dress is very comfortable to wear and a huge step up from the original. 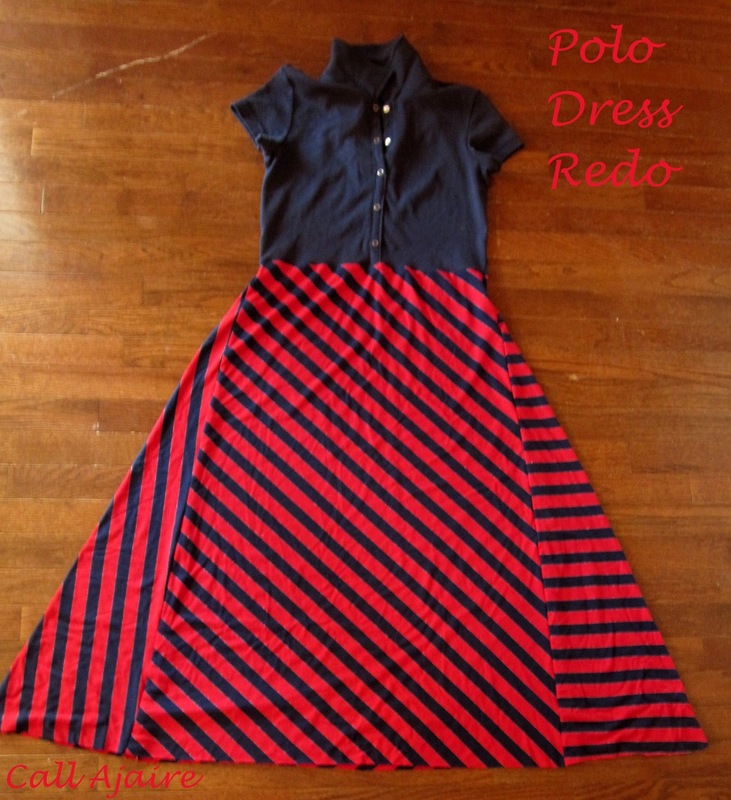 I’m really happy with this Polo Dress Redo. I think it’ll be great for the casual BBQs and birthday parties that abound this May. Thank you Shaffer Sisters for having me and giving me the push I needed to make something for myself! 🙂 Love ya. I am so glad it gas been good for you.